I have 9 favourite nail polishes, but I will split them up over the next three days because otherwise it would be a very long and boring post. So, in no particular order, here is part 1 of my favourite nail varnishes (of all time)! 1. Barry M Ice Cream Purple - £2.99 from Boots, Superdrug etc. The colour - it is the perfect mix between pastel and bright, making it very flattering on my pale skin tone. The brilliant price of only £2.99 compensates for any downfalls. The formula - I find that 3 coats gives a full coverage, and it takes a little while to dry, but I expect this with cheaper polishes. 2. Essie Matte About You - £10.95 from Boots. I absolutely love the look of a matte finish. It is very versatile because it goes over any nail polish . Some people say that after a while, little bumps start to form in the polish but I haven't experienced that yet. The price is quite high, but it's versatility means it is worth it. I use 2 coats to get an ultra-matte finish, but 1 coat works just fine. When used, your nail varnish only last for a couple of days before it chips, but this happens with all matte nail varnishes. 3. Barry M Blue Moon - £2.99 from Boots, Superdrug etc. I love the colour of it because it is bright and pastel at the same time. I use 3 coats to get a completely opaque colour. 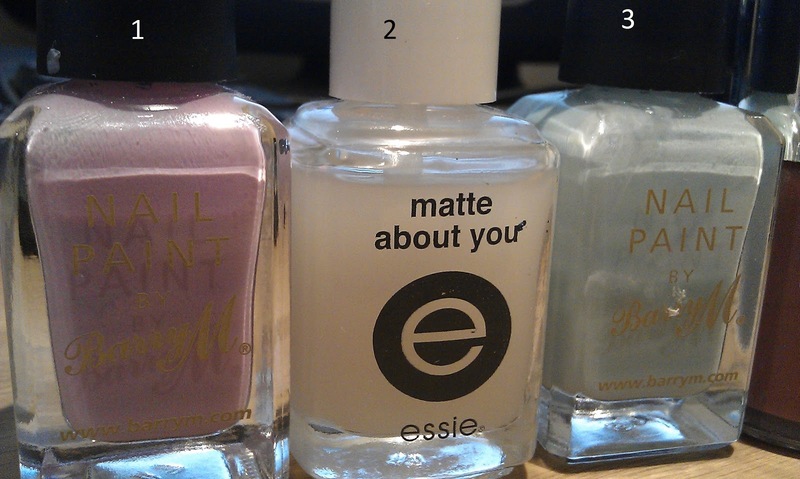 The Essie one is awesome! Thank you, have a nice day too!